SAP Rapid Data Migration (RDM) templates provide a methodology and technical blueprints that allow you to test your data against the SAP configuration rules prior to trying to “Go Live” with a data load. This proven methodology identifies data elements that would keep the record from loading properly in your new SAP target system. The RDM templates have three types of validations that happen to each record that you intend to load into SAP. There are lookup tables that test data for valid representations of data. If the data in your source system does not have matching values in SAP then the record fails the test and goes to an “exception” table. There are also tests for fields that must include data, they cannot be blank. There is also a test for some fields to follow a specific format. All records are tested in an offline system prior to loading the data in order to work through these exceptions before it’s too late and your project is not on time. Some data in an exception table can be fixed in a bulk fashion. For example, your field in the source system, may have the values “0” and “1” but the values that SAP expects are “A” and “B”. This is a perfect example for using a tool such as SAP Data Services to fix all of the records with a single process in bulk. For records that would require some sort of manual effort such as looking up data via another system or the internet, then a process to manually fix those exception records is needed. Many people choose to export the data to Excel and pass it around in order to repair the data. This process can be fraught with many pitfalls. Utopia has utilized the “Worklist Processing” function of Information Steward that allows the exceptions identified by the RDM templates to be loaded into a centralized task management component. This allows for modifying the exceptions and submitting the change for approval. This provides you with a secure system in which to manage the changes to your exceptions and to track progress. After all exception tasks are completed, they can then be loaded back into the Data Services RDM templates and reprocessed with expectation that they now pass all the validations. If exceptions remain, the state of each remaining issue will be reflagged back in the associated Worklist for additional review and resolution. 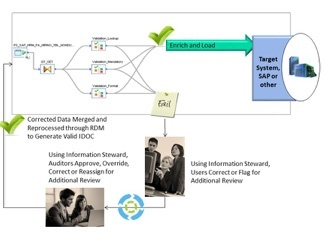 This graphic depicts the process that is followed in line with the SAP RDM methodology to manage exceptions using SAP IS. This product provides a way to manage and track exceptions in a tool that you will already have a skill set in if you are using the RDM best practices from SAP. No additional tool investment is necessary.